Well who would’ve guessed it? 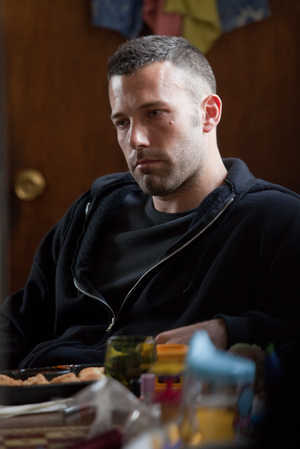 Ben Affleck is a good director! Gone Baby Gone was promising; The Town delivers. What else is remarkable is Affleck’s performance – it’s his best in, well, maybe ever. I don’t know what that says about Affleck. Perhaps he can only put his heart into a performance when his heart is in the story, and like Good Will Hunting, he had a large role in creating this story. Some critics have mentioned similarities to Heat and The Departed, and I agree on both accounts. Not that this film touches those two masterpieces; but some of the better sequences do seem to mirror those of Mann’s and Scorsese’s. And The Town has some of the very best, tense actions sequences in recent memory. Douglas MacRay (Affleck) and James Coughlin (Jeremy Renner) run a group of armored car robbers and bank thieves. They’re all poor townies from Charlestown, MA (as are most bank robbers in the world, if we are to believe the filmmakers). They are smart, effective, and backed by an Irish mob boss, played revoltingly well by Pete Postlethwaite. Their exceptional talent and resourcefulness , the likes of which you won’t likely find in real life Charlestown crews, is the most enticing part of the film; it is the juice that fuels the pace, and the factor that foreshadows the ending. There is one particular heist, when the gang is dressed in nun outfits, that includes an extended chase through the narrow streets of the North End. It is not only expertly choreographed and tight as a wire, but it is concluded with a brilliant dab of humor that is completely unforeseen and utterly, laugh-out-loud funny. In fact, I give Affleck quite a bit of credit for several times injecting quality humor into what is essentially a crime thriller. It not only lightens the mood from time to time, but it also establishes the humanity of the characters. These aren’t just heartless thugs. Yet what gives the film a leg up is a sure-handed identity. Whether or not you’ve ever been to Charlestown, MA, you’ll feel like you’ve just been there after seeing the film. That goes beyond location shooting and accurate accents. There is a pervading feeling of desperation and pride in the characters that mirrors what we’ve been told about the criminally infested town. Affleck himself disappears in this aura, and for a rare two hours, we forget that he is Ben Affleck (rather than constantly and painfully reminded, like his last seven or eight films). Like any good movie about a specific location, the Town itself is a palpable character in the story, like a dark, looming magnet always drawing the struggling characters back to their origins. Renner is believable and scary, but in a very different way than his role as the lunatic bomb squad captain in Hurt Locker. There is something in Renner’s eyes that convinces you that he is capable of violence. Here, he also puts on an excellent townie bad-boy act, with what I think might be a little extra dark makeup around the eyes to give the impression of either drug use or minor malnutrition. While The Town is one of the better films so far this year, I do have to say that I wish the ending was better than it is. No spoilers here, but I felt the film would have been better served with a slightly grittier ending. It seems too smooth and falls into place a little too nicely, and “nicely” isn’t a word that fits the Charlestown of this movie. This entry was posted on September 20, 2010 by Ian Kay. It was filed under The Town (2010) and was tagged with affleck, renner, the town.